Note: Story originally published in the Statesman Journal. Written by Carol McAlice Currie and Zach Urness. On the inside of a crevasse high on Mount Jefferson, between vertical walls of blue ice, Alison Fountain cradles the head of her husband, Tommy. She speaks to him softly every few minutes, checking his vital signs in the straightforward manner of the veteran nurse she is, even as her stomach knots with anxiety. 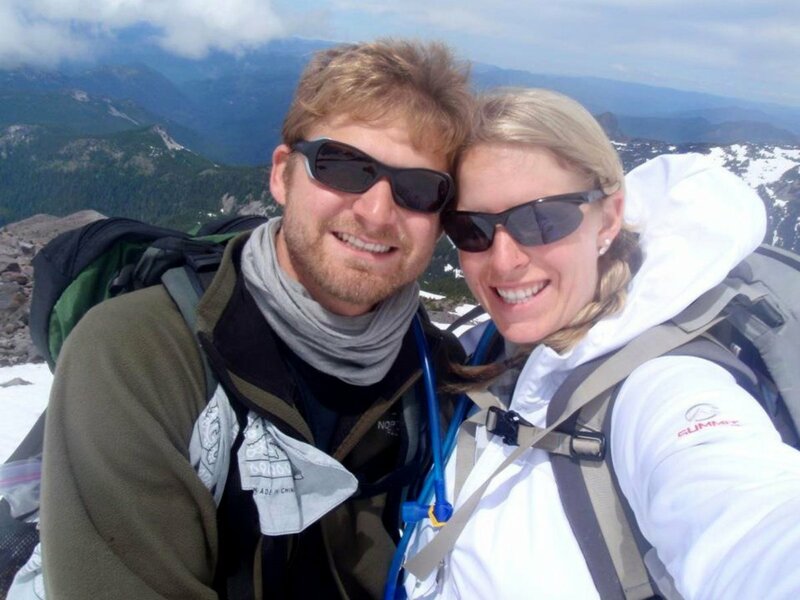 Tommy and Alison Fountain pose for a picture on Mount Jefferson during a 2014 trip. Photo courtesy of Alison Fountain. There are broken bones in his hands and arms, but that’s not what has Alison worried. She’s watching his breathing and alertness, observing the way he answers questions to determine the progress of the traumatic head injury slowly swelling his brain. Alison layers him in all the dry clothing they have — three jackets, two pairs of pants, long sleeves, long underwear, emergency blankets, hat, gloves, ski mask, wool socks, Buffs. She moves him to a place in the crevasse safe from falling rocks. Every 15 minutes or so, she walks toward the mouth of the crevasse, ice popping and crunching under her spiked crampons, to search for cellphone service and the status of a rescue effort launched a few hours earlier, just after the accident. Mount Jefferson is clear and cold this night, around 5 degrees at their 8,900-foot elevation. Moonlight is spreading milky light across the crags and ice-polished glaciers below the summit of Oregon’s second-tallest mountain. Her phone lights up, cutting brightly through the darkness. “Emergency crews are dispatched. Turn your phone off until you need it,” says a text message from her brother, Dalen Ashby. She aims a flashing headlamp into the sky, hoping to catch the attention of the rescue teams and then returns to Tommy. His breathing is starting to become labored. She knows instinctively time is running out. Then there is a sound. It’s distant at first, far off. But soon the thump-thump-thump of helicopter blades breaks the silence. Alison sprints toward the opening in the crevasse, jumping and flailing her arms, flashing the headlamp. A spotlight breaks the darkness, finding her at the mouth of the crevasse. Alison drops to her knees in relief, crying with happiness. The helicopter hovers for a moment and then does something she doesn’t expect. It turns and vanishes into the night, leaving them alone, two tiny specks on a huge white mountain under a canopy of distant stars. Read more at The Statesman Journal.